Gentle, verbally guided group classes are offered for new clients on the first Sunday of every month. Just $10! Our next intro class will be on April 7, from 6:30pm-7:45pm. Sign up early because there are only four spots per session! 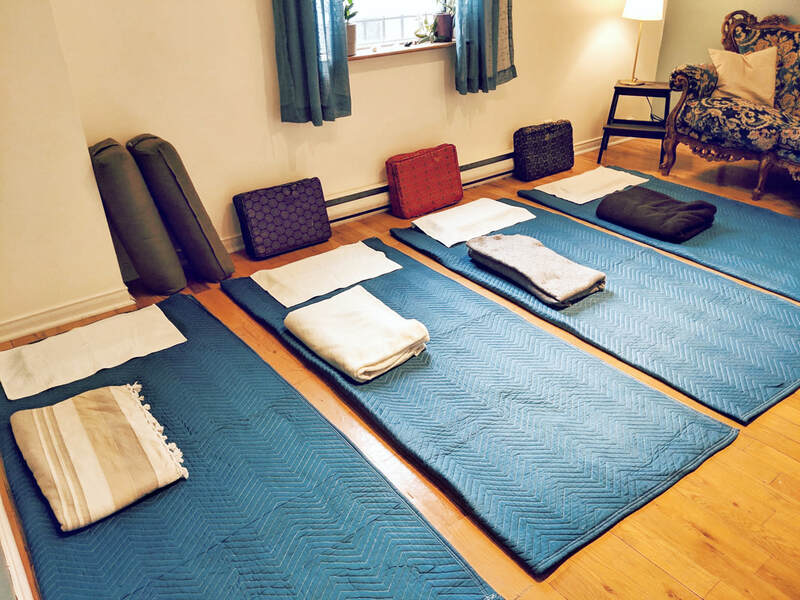 If you have chronic pain, are injured, or if you feel (or suspect you'd experience) stress as a result of a body-based mindfulness practice, we strongly recommend booking a private consultation with Sarah before joining a group class. This will help set you up for success moving forward! ​Scroll down if you'd like more information on group classes. Email Sarah to save your spot! This is the perfect option for people who have specific movement goals or for people who are looking to manage chronic pain or recover from injury. ​Whether you want to do something better (play an instrument, free-throw, sit comfortably at your computer or in meditation...) or whether you're looking for more ease in everyday life, Sarah will tailor each lesson specifically for you and your needs. There is no stretching, massaging, or strength training involved. These lessons are done fully-clothed on a low, padded table or on mats on the floor. Sarah will create an engaging, verbally-guided movement session just for you that focuses on your specific interests and goals. There is no stretching or strength training involved. In group classes, we are invited to follow gentle, verbally guided movement sequences that explore functional themes like twisting, rolling, reaching, lengthening or bending. Each lesson uses purposeful attention to develop and refine a sense of embodiment, agency, ease and precision in our everyday actions. Depending on the interests and needs of participants, we explore the lessons while lying down, sitting, standing, or in our imaginations. Some lessons explore grand gestures, while others focus on smaller movements of the eyes, hands, or mouth and jaw. At our own deliberate pace, we are encouraged to explore and compare different ways of doing a movement so that each of us can find - or begin to investigate - which ways work best for us. With practice, our ability to feel these internal relationships is strengthened, bringing a sense of adaptability and empowerment to to our actions both in and out of class. Whether you're generally tuned-in or tuned-out to your body, you're welcome here! In Feldenkrais lessons, how a movement feels is far more important than how a movement looks. We are not expected to verbally share or visually demonstrate our experiences to the class. We are encouraged to visualize movements if an action might cause discomfort or if that movement isn't available to us. Because everyone benefits from movement visualization, we will practice this technique together during class regardless of each person's abilities. ​These classes are body positive, trauma informed, and super approachable. There is no strength training or stretching, and frequent rests are offered. Hands-on help is available for those who request it. If you'd like to talk to Sarah about any particular needs you might have, send a note and they'll be happy to help.